ab6586 is designed to bind specifically to NATIVE collagen epitopes composed of multiple subunit strands. Negligible cross-reactivity with Type I, II, III, V or VI collagens. Non-specific cross reaction of anti-collagen antibodies with other human serum proteins or non-collagen extracellular matrix proteins is negligible. 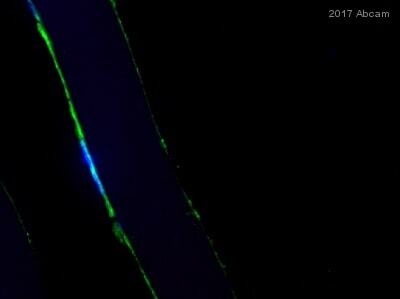 Full length native protein (purified) corresponding to Collagen IV. 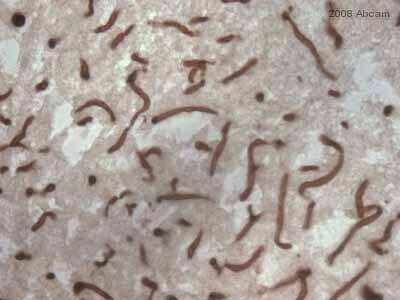 Collagen Type IV from human and bovine placenta. The immunogen maintains the native conformation of the protein. At least 11 genetically distinct gene products are collectively referred to as 'collagen types' or other proteins and proteoglycans of the extracellular matrix. In humans, collagens are composed of about 20 unique protein chains which under go various types of post-translational modifications and are ultimately assembled into a triple helix. This results in great diversity between collagen types. Collagens are highly conserved throughout evolution and are characterized by an uninterrupted "Glycine-X-Y" triplet repeat that is a necessary part of the triple helical structure. For these reasons it is often extremely difficult to generate antibodies with specificities to collagens. The development of type specific antibodies is dependent on NON-DENATURED three-dimensional epitopes. This preparation results in a native conformation of the protein. 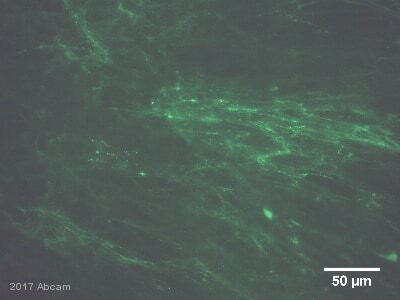 This antibody is well suited to detect extracellular matrix proteins in normal as well as disease state tissues. Disruption of tissue organization is the hallmark of neoplasia. Malignant lesions can be distinguished from benign by examining the breakdown of basement membranes and loss of 3-dimensional architecture. Malignant cells are presumed to use matrix metalloproteases to degrade barriers created by the extracellular matrix which then allows metastasis to occur. Collagenases, stomelysins and gelatinases can collectively degrade all of the various components of the extracellular matrix, including fibrillar and non-fibrillar collagens and basement membrane glycoproteins. Immunoaffinity chromatography using immobilized antigens followed by extensive cross-adsorption against other collagens, human serum proteins and non-collagen extracellular matrix proteins to remove any unwanted specificities. Our Abpromise guarantee covers the use of ab6586 in the following tested applications. WB 1/1000 - 1/10000. Use under non reducing condition. This product is not recommended for use under denaturing conditions in WB, IP, and ELISA. We would suggest testing it under native conditions. Type IV collagen is the major structural component of glomerular basement membranes (GBM), forming a 'chicken-wire' meshwork together with laminins, proteoglycans and entactin/nidogen. Arresten, comprising the C-terminal NC1 domain, inhibits angiogenesis and tumor formation. 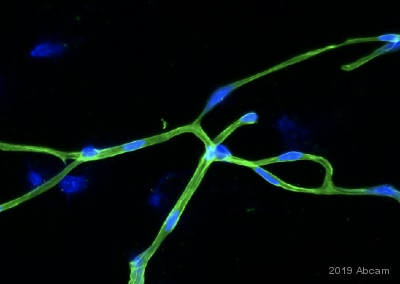 The C-terminal half is found to possess the anti-angiogenic activity. Specifically inhibits endothelial cell proliferation, migration and tube formation. Inhibits expression of hypoxia-inducible factor 1alpha and ERK1/2 and p38 MAPK activation. Ligand for alpha1/beta1 integrin. Defects in COL4A1 are a cause of brain small vessel disease with hemorrhage (BSVDH) [MIM:607595]. Brain small vessel diseases underlie 20 to 30 percent of ischemic strokes and a larger proportion of intracerebral hemorrhages. Inheritance is autosomal dominant. Defects in COL4A1 are the cause of hereditary angiopathy with nephropathy aneurysms and muscle cramps (HANAC) [MIM:611773]. The clinical renal manifestations include hematuria and bilateral large cysts. 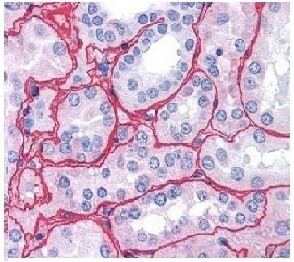 Histologic analysis revealed complex basement membrane defects in kidney and skin. The systemic angiopathy appears to affect both small vessels and large arteries. Defects in COL4A1 are a cause of porencephaly familial (PCEPH) [MIM:175780]. Porencephaly is a term used for any cavitation or cerebrospinal fluid-filled cyst in the brain. Porencephaly type 1 is usually unilateral and results from focal destructive lesions such as fetal vascular occlusion or birth trauma. Type 2, or schizencephalic porencephaly, is usually symmetric and represents a primary defect or arrest in the development of the cerebral ventricles. Belongs to the type IV collagen family. Contains 1 collagen IV NC1 (C-terminal non-collagenous) domain. Alpha chains of type IV collagen have a non-collagenous domain (NC1) at their C-terminus, frequent interruptions of the G-X-Y repeats in the long central triple-helical domain (which may cause flexibility in the triple helix), and a short N-terminal triple-helical 7S domain. Lysines at the third position of the tripeptide repeating unit (G-X-Y) are hydroxylated in all cases and bind carbohydrates. Type IV collagens contain numerous cysteine residues which are involved in inter- and intramolecular disulfide bonding. 12 of these, located in the NC1 domain, are conserved in all known type IV collagens. The trimeric structure of the NC1 domains is stabilized by covalent bonds between Lys and Met residues. Proteolytic processing produces the C-terminal NC1 peptide, arresten. 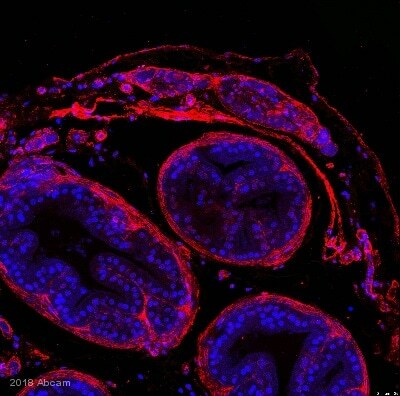 Paraffin-embedded human kidney tissue stained for Collagen IV using ab6586 at 1/400 dilution in immunohistochemical analysis with strong staining observed in glomeruli. Paraffin-embedded human liver tissue stained for Collagen IV using ab6586 at 1/400 dilution in immunohistochemical analysis, strong staining was observed in the sinusoids. ab6586 staining Collagen IV in Dog liver tissue sections by Immunohistochemistry (IHC-P - paraformaldehyde-fixed, paraffin-embedded sections). Tissue was fixed with formaldehyde and blocked with 5% serum for 30 minutes at 25°C; antigen retrieval was by heat mediation in a 10mM citrate buffer, pH 6.0. Samples were incubated with primary antibody (1/200 in PBS + 1x casein) for 1 hour at 37°C. An undiluted HRP-conjugated Horse anti-rabbit IgG polyclonal was used as the secondary antibody. ab6586 staining rat brain tissue sections (ab4616) by IHC-Fr. Sections were acetone fixed and blocked with 1% serum for 20 minutes at 25°C. The primary antibody was diluted 1/300 and incubated with the sample for 30 minutes at 25°C. 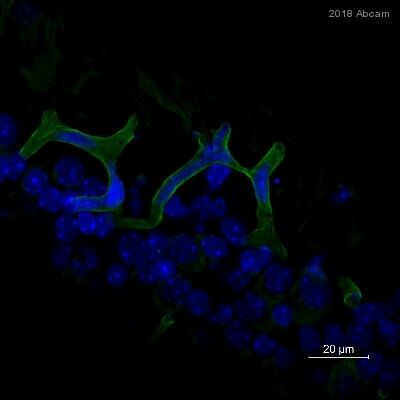 A biotinylated goat anti-rabbit IgG antibody was used as the secondary. Immunohistochemistry (Frozen sections) - Anti-Collagen IV antibody (ab6586)This image is courtesy of an anonymous Abreview. ab6586 staining Collagen IV in heart tissue by Immunohistochemistry (Frozen sections). The sections were fixed in Acetone prior to blocking with 100% SuperBlock Blocking Buffer for 20 mins at 23°C. The primary antibody was diluted 1/50 and incubated with the sample for 12 hours at 4°C. 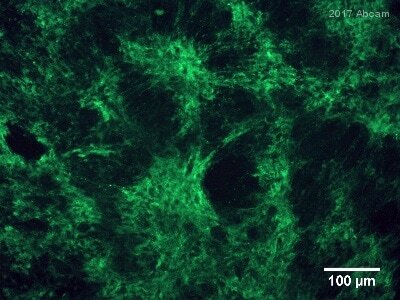 ab6720 was used as the secondary antibody, diluted 1/100. Immunohistochemistry (Frozen sections) - Anti-Collagen IV antibody (ab6586)Image courtesy of Daniel Holod-Betz by Abreview. 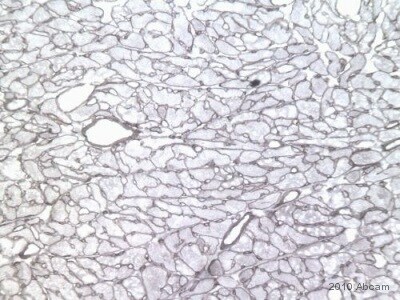 ab6586 staining Collagen IV in pig epithelial tissue by Immunohistochemistry (Frozen sections). Tissue was fixed in acetone then incubated with ab6586 at a 1/200 dilution for 1 hour at 25°C. The secondary used was ab96886, a goat polyclonal to rabbit IgG - H&L (DyLight® 649), used at a 1/500 dilution.